Valletta residents are at the centre of plans for 2018. Discussions are taking place through the Valletta Forum; a space through which the Valletta 2018 Foundation reaches out to the community serving as a platform of communication. Valletta 2018 Foundation Chairman Jason Micallef discussed a number of projects for, and in conjunction with, the Valletta community starting from next year which marks the 450th anniversary of Valletta. Mr Micallef was addressing the fourth Valletta Forum meeting held on Monday, 13th July at the Camarata building, home to some 52 families, in Merchants Street, Valletta. People of various ages, including elderly and teenagers, gathered in the building’s courtyard while others followed the discussion from their balconies, joining the crowd later on in the evening to share their views. The Valletta Forum is a space through which the Valletta 2018 Foundation reaches out to the community serving as a platform of communication. Mr Micallef also made reference to the ongoing work on the Valletta Masterplan which will be released for public consultation over the coming weeks. The Valletta 2108 Foundation, he added, contributed and submitted various proposals which will later be part of the draft policy document. These include plans for a childcare centre, a day care centre for the elderly and means to make affordable property available by means of a public-private partnership, to people who were constrained to move out of Valletta and do not afford to buy the expensive property on the market. However, Mr Micallef stressed this will not happen overnight and is part of a long term strategy for Valletta beyond 2018. Mr Micallef also pointed out that Valletta 2018 is about a Cultural Programme spanning over a year which includes local festivities, established events as well a new and contemporary projects. Mr Marco Vella, Assistant Head of San Ġorġ Preca College, Valletta Primary School, also addressed the meeting. He spoke about the students’ involvement in Valletta 2018 projects and the benefits for them. He mentioned Discover Valletta, Belti, and refurbishment works being undertaken at the school’s theatre, which, when complete, will be available for use by the community besides the students themselves. Jason Micallef introduced Mr Antoine Farrugia, a Valletta artist, who will be coordinating activities related to the 450th anniversary of Valletta. This will be marked next year with several events being organised by the Valletta 2018 Foundation and the Valletta Local Council, in collaboration with Valletta residents and organisations. Valletta residents expressed their gratitude for having the meeting held at a place they feel “home” while sharing their views about Valletta as a European Capital of Culture and the need to continue focusing on projects and initiatives in the lower parts of Valletta. 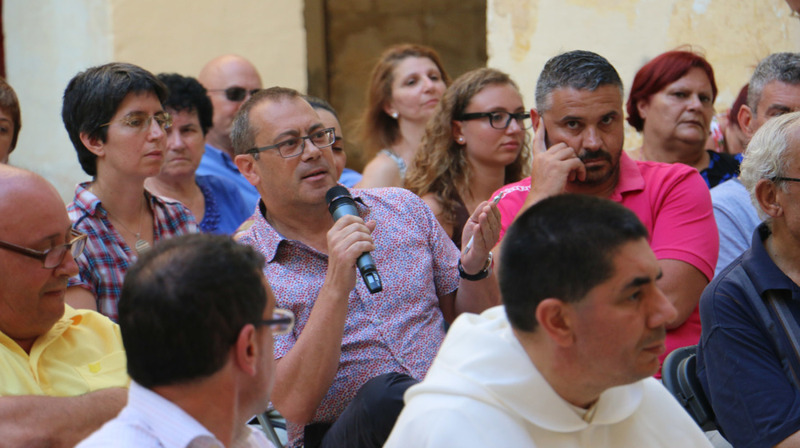 The meeting with Valletta residents and organisations was followed up by another with the owners of establishments in Strait Street, last week.